It's fun to mix cocktails or cook food you have no history with. In other words drink or food where you have no idea how it is supposed to taste. 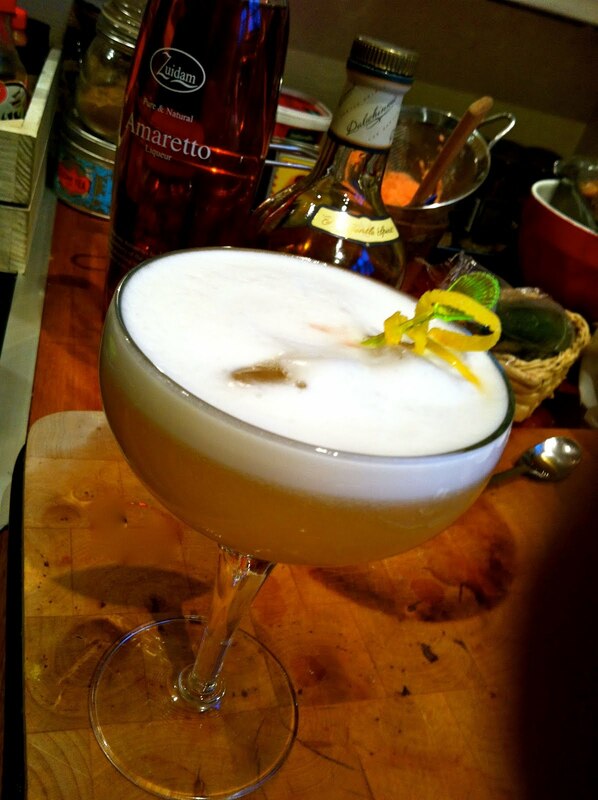 Amaretto Sour seems to be a cocktail that people have a history with - something sweet, bland nonthreatening served to people who really don't enjoy strong cocktails. But then Jeffrey Morgenthaler spiced it - and spiked it - up. And he sold me with the claim that he makes the worlds best. So promptly at 9 a.m. I stood in front of my booze seller as a somewhat tired employee opened the door to let the first customer in. I went straight for the orange Curacao shelf, where I picked out a bottle of liquid gold: Pierre Ferrand Dry Curaçao Ancienne Méthode. I tried it last night at an amazing seminar i the fine baroque manor Moltkes Palæ in Copenhagen in a Brandy Cocktail - well a Cognac Cocktail because it's base spirit was Pierre Ferrand 1840 Cognac. And then I pointed at a middle of the road Amaretto and was promptly chastised: If you go for the best in Curacao, then why not for the best in Amaretto? And then he sold me a bottle of Zuidam Amaretto. So he might have looked tired but he was a good salesman. Put everything in a cocktail shaker but don't add any ice yet. Dry shake for a minute then add ice and shake for another 2 minutes. Strain in to cocktail coupe over fresh ice and garnish with a lemon twist and an Amarena cherry.